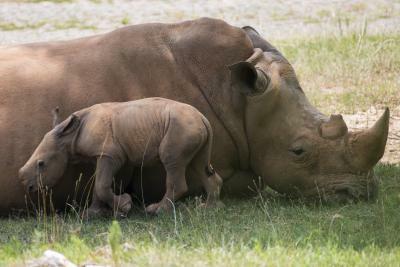 ASHEBORO, N.C. — For the second time in less than two weeks the North Carolina Zoo is excited to announce the birth of a southern white rhino. She was born during the overnight hours of Friday, July 13, 2018. Kit — the calf’s mother — gave birth in the Watani Grasslands habitat that’s part of the zoo’s public viewing area. Zookeepers described the calf as healthy and doing well and plan to do a thorough check-up soon. She’s expected to gain 100 pounds a month in the first year and could weigh 3,500 to 5,500 pounds when fully grown. The Zoo’s 40-acre Watani Grasslands expansion — completed in 2008 — was created specifically for a breeding rhino herd, making this second birth a dream come true for the Zoo. In a twist of fate, the first rhino calf was born on July 2, 2018, one day after Curator of Mammals Guy Lichty started his retirement. Lichty has been instrumental in leading the Zoo’s rhino breeding program for 25 years. The Zoo has had rhinos since 1976 and is part of the Association of Zoos and Aquariums (AZA) Species Survival Plan (SSP) to keep a sustainable population of southern white rhinos under human care. It’s also involved in global conservation efforts to save this species. “Congratulations again to the North Carolina Zoo on this second birth of a southern white rhino! The Zoo’s efforts to save this species are yet another example of the leadership role the Zoo plays in conserving important species both at home and around the world,” said Susi H. Hamilton, secretary of the N.C. Dept. of Natural and Cultural Resources. Southern white rhinos were hunted to near extinction by the beginning of the 20th century for their horns, which some erroneously believe provide medicinal benefits. Rhino horn is constructed from keratin which is the same material that makes up human fingernails and hair. Today, populations in the wild still face significant threats from poaching and habitat loss. In addition to their work with the rhinos at the North Carolina Zoo, staff work on projects in several countries in Southern Africa to protect wild rhinos from poaching and save the species from extinction. The Zoo’s herd now consists of Stormy and females Linda and her female calf (yet unnamed), Kit (and unnamed female calf), Natalie and Abby. Two older rhinos, Stan (male) and Olivia (female) live in an off-viewing retirement habitat for a total of nine rhinos living at the North Carolina Zoo. The second-largest land mammal after elephants, rhinos are pregnant anywhere from 16-18 months (elephants are pregnant for approximately 24 months). A female rhino will only give birth every two to five years. At full maturity, a southern white rhino will have two horns, grow to 12-13 feet long and up to 6 feet from hoof to shoulder, and weigh 4,000 to 5,000 pounds. They can live 40-50 years and run at impressive speeds of up to 30 miles per hour. These gentle giants are herbivores and graze on grass, which helps maintain the diverse African grasslands, increase plant diversity and provide grazing areas for other animals that share their natural habitat: the savannahs of Africa. They have a similar diet at the Zoo, getting most of their food while grazing the 40 acres of the Watani Grasslands Reserve.